The ongoing financial crisis has made abundantly clear the fact that we are connected by a highly complex system of economic and human capital. As this system has fallen into crisis in the past few years, we have seen the focus turn to the mechanisms and institutions responsible for regulating its health and those whose job was to produce value. Without a touch of irony, the growing environmental crisis has drawn a comparable (and perhaps analogous) type of cautionary focus. Yet, unlike economic and human capital, natural capital has no dedicated system of measurement, monitoring or reporting. However, a recent United Nations research initiative, The Economics of Ecosystems and Biodiversity (TEEB) suggests this may not be the case for long. TEEB’s research seeks to develop new quantitative and evaluative tools to understand the inherent economic and external values embodied within specific ecosystems. Water filtration, storm management, waste treatment, climate regulation and the provision of food and medical supplies are all understood to be connected to direct social, environmental and economic benefits. For example, a TEEB report describes that over 20% of the planet’s coral reefs are already seriously degraded or under imminent risk of collapse. While the global degeneration of coral reefs will impact different communities in different ways, those highly dependent on fish protein and local economic development through tourism could face dramatic loss. 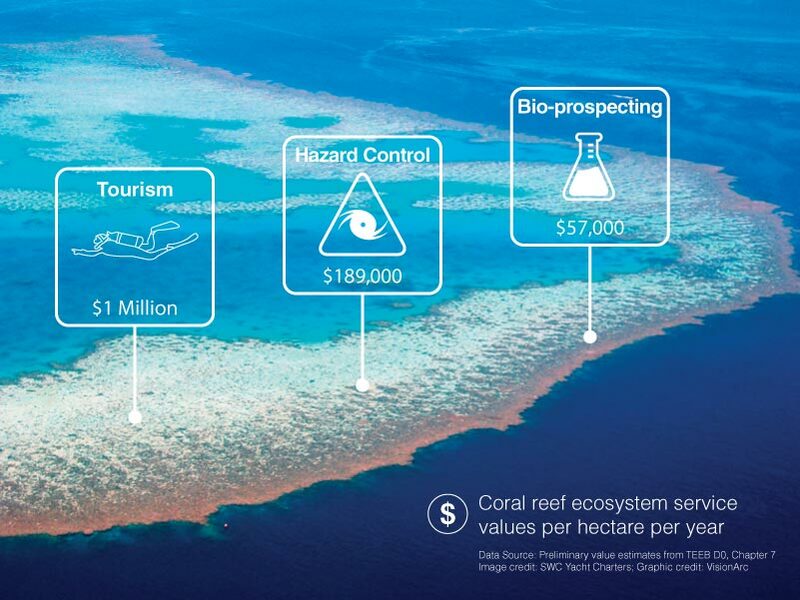 Coral reefs are therefore understood to embody a critical range of ecosystem service values. Preliminary TEEB estimates these to be 189,000 US$/hectare/year for natural hazard management; up to 1 million US$/hectare/year for tourism; up to 57,000 US$/ha/year for genetic materials and bio-prospecting; and up to 3,818 US$/ha/year for fisheries. The study goes on to profile a series of other ecosystems including wetlands and forests, and provides assessed values for land use and certain genetic resources connected to major market segments such as the pharmaceutical industry. Developing new mechanisms to measure the value of environmental services is of crucial importance, yet not without their limitations. These mechanisms may, after all, be vulnerable to the same flaws as those regulating the financial system. Without proper understanding and design, the invention of new markets and terminology for ecosystem services may undermine other, less quantifiable values such as those with moral or cultural significance. The challenge in adopting the term “services” as a way to describe environmental benefits will be akin to adopting the term “growth” to describe financial gain- both risk a metaphor getting the better of initially good intentions. It will therefore be necessary to understand economic value as representing only one possible metric for benefits drawn from ecosystems and natural resources. In the meantime, TEEB’s findings from preliminary reports prepared over the last two years will be presented next month at a global business symposium on biodiversity.